Every month we now have avid stationery connoisseur, Greg McIndoe, reviewing our delightful Papergang boxes. This month it’s the Natasha Durley “Midnight Jungle” box! Box no. 19 was created in collaboration with illustrator and surface pattern designer Natasha Durley and was "midnight jungle" themed. 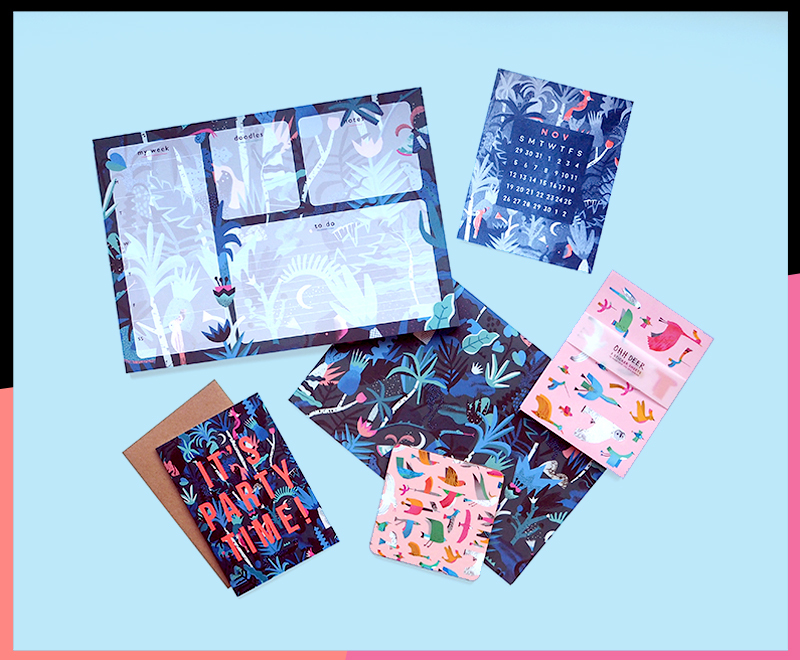 I was a huge fan of the tropical trend that swept through the design world this Summer and so I was very excited when I saw Ohh Deer were taking it in a darker, more Autumnal direction with this new collection. First off, the sheet of gift wrap was covered in the box's signature pattern and is therefore a thing of extreme beauty! It's filled with tactile texture and a range of lush colours that will give a lush finish to any gift. After all, who doesn't want to receive a present covered in elephants and snakes!? A coaster was something the Papergang had never included before but September was the month. Covered in birds of every colour of the rainbow, the coaster will add a splash of happy sunshine to any interior. 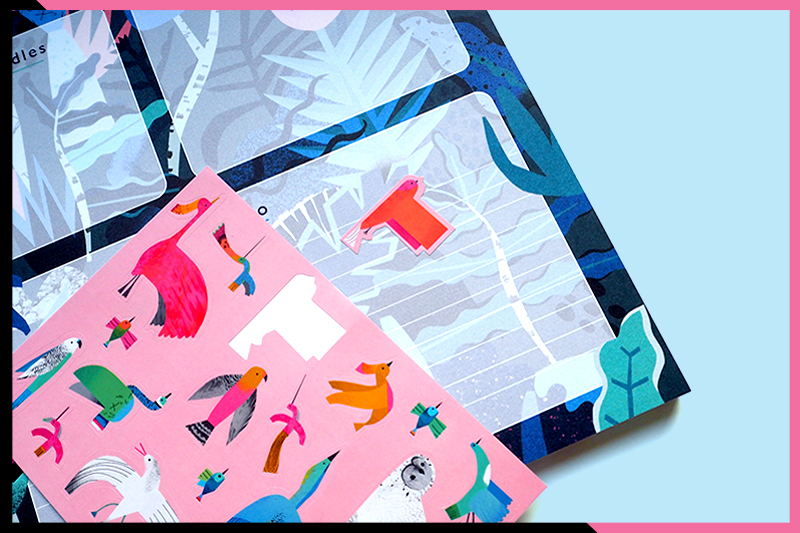 The calendar print is something Ohh Deer have included in every box and it is always beautifully designed. Birds took centre stage again as they were picked out in neon orange ink on top of a base of blue textures and shapes. I'll have to wait until November to use it but I can't wait to display it on my wall. The deskpad was the biggest item in this month's box and probably my favourite! Sections for planning your week, writing to-do lists, doodling and taking notes are interwoven with botanical details to make a stunning addition to any desk. I already have a deskpad (also from Ohh Deer) on my desk at home so I will be taking this one in to show off to all my similarly stationery addicted classmates. A set of stickers has become another Papergang classic. 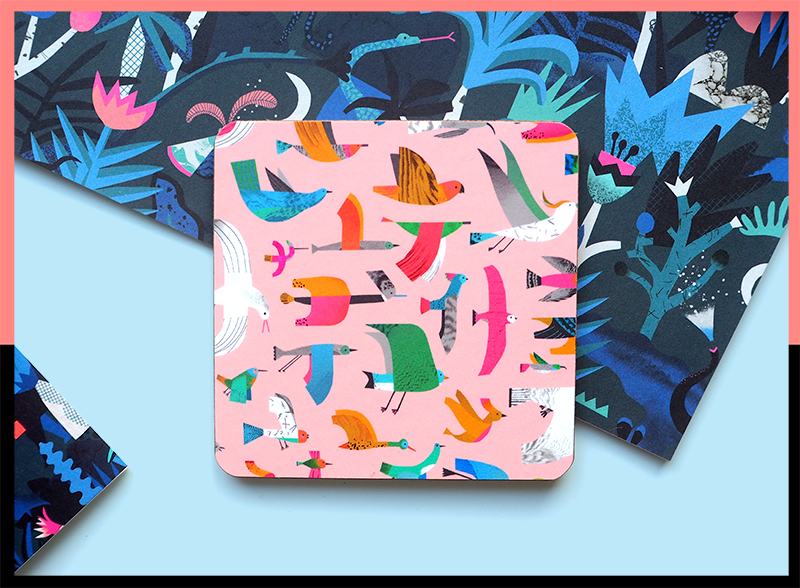 This month’s vibrant bird stickers are perfect for customising your deskpad with an extra pop of tropical! Finally, the Papergang also keep your stock of greetings cards filled with illustrated beauty. This month's was featured the "midnight jungle" pattern emblazoned with "It's Party Time" and is suitable for many occasions (as long as it is hosted by someone with good design taste of course).